Roland Mouret's 'Almeley' top is both elegant and versatile, so you can wear it to all kinds of events, including weddings, parties and christenings. 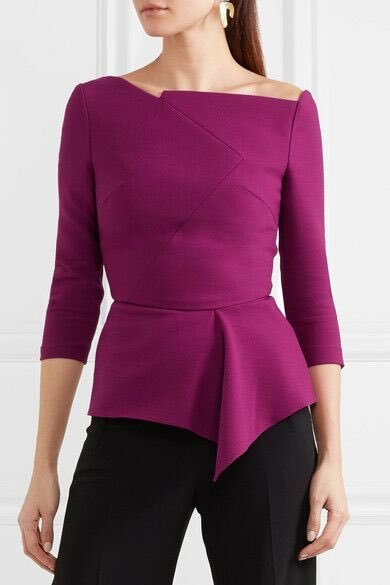 Made from purple crepe, it's artfully folded to create an asymmetric peplum hem and draw attention to the smallest part of your waist. This luxury clutch is made from Lime Italian Soft Calfskin Leather with Blind Embossed Susan Szatmáry logo on top.. Cross body or hand carry, push closure-fastening to open and brushed Silver frame detail. Brushed Silver, Gold, Grey and Balck Resin closure on top. The clutch has a detachable strap and chain. Free pocket and Nugate Lambskin Lining inside. You can fit your lipstick, cellphone and cards.